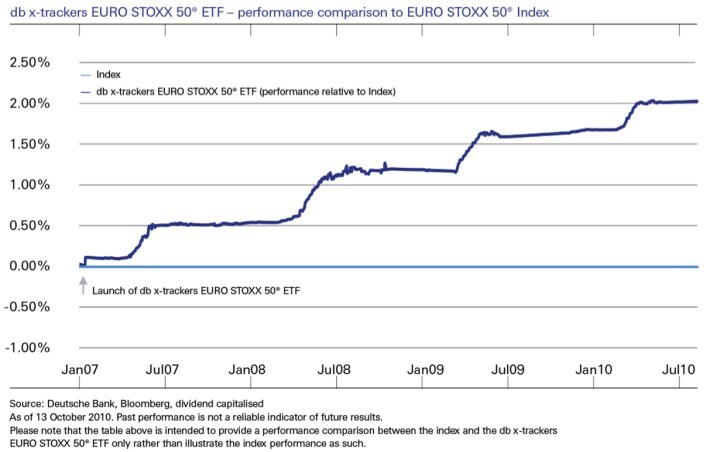 Deutsche Bank’s ETF platform, db X-trackers, provides a rather remarkable ETF tracking Euro Stoxx 50 (which is the most widely used regional blue-chip index in Europe). What makes it remarkable is its cost - the fund's TER is 0.00%. But even more surprisingly, the passively managed ETF has been consistently outperforming its benchmark index roughly by 0.5 per cent annually since 2007. The fund managers explain on their site that the ETF outperformance is "generated through activities such as securities lending". Are there any other mechanisms at play here which might explain this kind of tracking error? Why the discrepancy between the fund's NAV and the index has not been eliminated by arbitrageurs? Because an ETF is not the Underlying Index, any ETF SHOULD actually award more than the Index on "Developed" aka "Easy to Access" aka "We don't have regulations that make the market impossible to Invest without ETF". You're taking additional risk by financing a bank operations. I mean Lehman was not in the ETF business, but it could have been, so taking a huge counterpart risk for less than 1.00%/year is REALLY not worth it, you'd better invest in the bank bonds or arbitrage CDS/bond. An index is just an abstract concept and does not hold securities. Hence no source of revenue from lending them. A portfolio mirroring an index holds the securities and can in fact generate revenue by loaning the securities to others wanting to short the stocks. This provides a positive bias. That is often offset by a negative bias when the index portfolio is under-invested to keep cash on hand for withdrawals, or from inflows not yet invested (cash drag), plus tracking error from finite rebalancing etc. That said, the answer is more theoretical than practical. I have not seen such a chart for an index-tracking ETF. 1) How does DB make money given a zero expense ratio? This is covered by Dirk and Lliane. Basically, DB gets cheap funding and stock loan fees in return for paying marketing / index / hedging costs. The ETF investor gets zero expense ratio in return for taking DB credit risk. 2) Why does it look like the etf outperforms the index in that plot? Dividends. The plot compares against SX5E, which does not take into account dividend gains, but the etf does. That's why there is a weird bulge in May, when most EU stocks pay out divs. Comaparing against the total return index (SX5T) shows the ETF still outpreforms by 32bps / year, but I think the comparison is not correct in that SX5T witholds taxes on the divs, whereas I'm not sure if the ETF does. Comparing against SX5E with divs taken into account and a similar tax treatment shows the ETF underperforms by 45bps / year. Which is right? I don't know. But I'm fairly certain there's no arb. 99.99% of the time you think you've found an arb, you haven't. Not the answer you're looking for? Browse other questions tagged arbitrage performance etf benchmark or ask your own question. How often do ETF creation units baskets change?